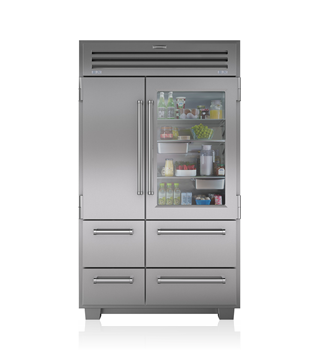 As you might expect of a chef, the client wanted the absolute best appliances. She had already chosen Sub-Zero, Wolf, et Cove, so the discussions were based around which models to select. The designers had her meet with the regional Sub-Zero, Wolf, et Cove chef, so she could ask specific questions about the different units and how they performed specific cooking tasks. 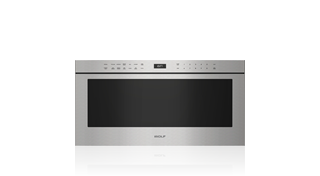 Ultimately she decided to make her appliances the hero of her kitchen – the designers created a “feature wall” of appliances by incorporating stainless fronts on the cabinets that ran next to the PRO 48 with glass door refrigerator and built-in convection steam oven, microwave and warming drawer. 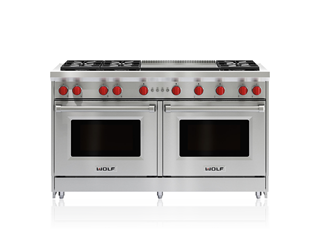 Anchoring the other end of the working kitchen is the Wolf 60” dual fuel range, a powerhouse that easily meets the client’s needs of preparing meals for as many as 15 or 20 people.